A nice little drive from Phoenix through the mountains puts you in a great town called Payson. Nestled at about 5,000 feet on the Mogollon Rim you find yourself in a different climate and vegetation. 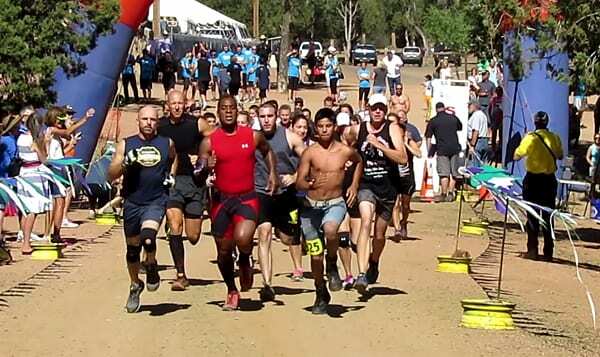 On the outskirts of town are the rodeo grounds and the location for the 2nd Annual Mogollon Monster Mudder 5k obstacle race. I did not have any expectations about this race and how easy or difficult it might be. In addition to myself I brought along a few other athlete's some who have ran many other OCR races and a few that have only done a handful of races. I asked them to push hard and give me an honest assessment. Traveling from out of town we approached the address on the directions and there was no signage with the race name saying where to turn. We had to make a few u-turns until we found it tucked off the highway in the rodeo grounds. We found a very large open lot to park in. We arrived early so there were not a lot of problems. An OCR race is comprised of many facets that help bring it all together. The race its self is very important but if the other components are not planned then getting racers to the starting line and through the race will not happen smoothly. At the registration tables we found fairly short lines with some of the friendliest volunteers I have met. Warm, happy and very helpful. We got our bibs and timing bracelet all at the same area. The timing bracelet had to be worn on the right wrist only with a velcro strap and safety pin. Come to find out that had to do with the finish line, which I will touch on later. I was registered for wave 1 for a 9:00am start time. There were about 50-60 people behind me. You can usually find me at the front of the pack as I like to get out in front early. A few of my racing buddies were there along side of me. In the back of my mind I knew there were around 30-35 obstacles and in just over 3 miles that will be challenging. As a competitive racer myself I was smiling and excited to take in this course. 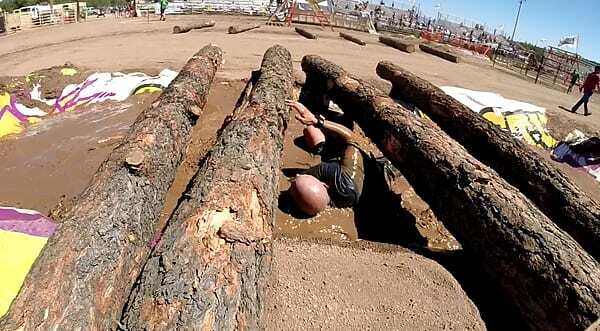 Within 300 yards you had your first obstacle which was a big pile of boulders to run over. Then it was onto the timber climb which had ropes to assist you to get up and over. Approaching the next obstacle the Mogollon Rim Wall I found this one to be very cool. Climbing up about 30 feet and then over into a big pool of waist deep cold water that was waiting for us on the other side. I was a bit cautious myself and only jumped about half way down. One of the toughest obstacles for me being so tall was the tunnel of doom. This ran about 100 yards and was very dark inside with a few hanging lights. I had to walk hunched over for that whole distance. With this many obstacles place this close together I was anticipating there would be a few of them that might have backlog issues and long wait times. The only one we encountered was the Tangled Forest obstacle that featured hay bales stacked for you to climb over a 9 foot wall and they were loosely stacked on the downside which was kind of dangerous. I did not have to wait long myself. Later on I went back after finishing my own race and I did see a mild backlog at that obstacle. After that the course had some good separation between each of the next obstacles. I know on the sandbag lug carry it was not clear on how far we were supposed to carry them. The volunteer’s did a get job of quickly correcting that. Although the obstacles for me were not tough the close proximity of them had me quickly gasping for air. Over the next mile we were going to face about 15 more obstacles before heading off trail which included trail running on a fun rocky terrain with some easy boulder climbing and rock jumps over about 1.5 miles. While running on the back trail I found myself alone with a few runners just a few minutes ahead of me. What was nice is you could hear the music and announcer pumping up the crowd as some of the first runners made their way into the Coliseum of Terror which featured an array of obstacles inside a small rodeo stadium. 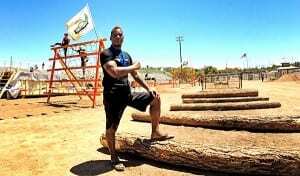 The obstacles inside the stadium were packed pretty tight and gave you back-to-back challenges to test your endurance. The first set of bleachers you had to pick up a fire hose and carry it to the top and back down, then you had to finish 2 more sets of bleachers before entering the main stadium by running through 3 young high school boys hitting you with soft football blocking pads. Now it was time to get wet and dirty. Making our way through a watery mud crawl onto two sets of standard monkey bars. As I continued through the course I was getting exhausted and then came upon a water obstacle that was most challenging. Out of breath we climbed down into a pool of water with large cut tree’s placed closely together that were laying across the top of water. Under the water you were able to catch small breaths along the 4-5 logs we had to crawl under. Later on in the race I did see people going over them versus under them. As the race was nearing the end we had to crawl through a series of muddy standing tires, those were really fun. Sprinting to the finish line the volunteer at the end instructed you to swipe your right arm across the mat that was on the table to get your finished time. I was not keen on that process. 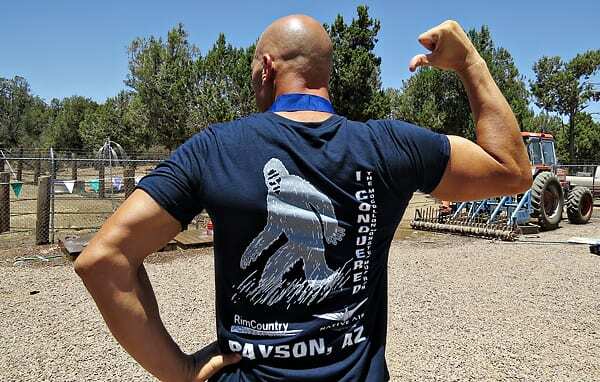 We got our finisher medal and a very cool t-shirt with big foot on the back. As I mentioned in the beginning I did not know what to expect with this being a fairly new OCR company. I would have to say this race was a great surprise and as an athlete that loves challenging races this is one I would highly recommend to my elite running friends along with the first time racers and those families that like to run together. I would give this race a 4 out of 5 stars. 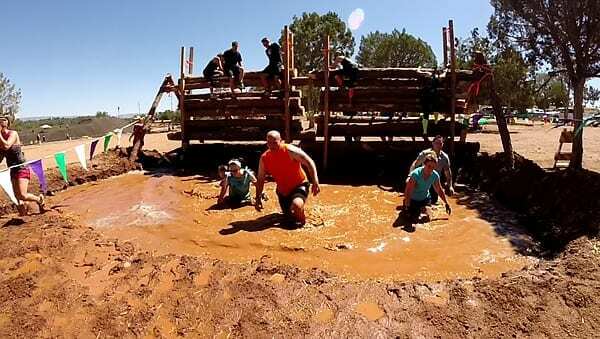 Did you do the Mogollon Monster Mudder? Share your own rating & review about the event today! You can see also see my video review of this event by following the link below.